Renauld Ray certainly made up for lost time as a football player. The 1996 Orrville graduate didn’t go out for the Red Riders’ grid team as a freshman or sophomore. However, he then decided to take on the challenge of adding another sport to go with his already well-established basketball resume, which would eventually include starring on back-to-back state title teams. Ray burst upon the high school football scene as a junior wide receiver with 40 receptions for 732 yards and six touchdowns in 1994 for Coach Bill McMillan. 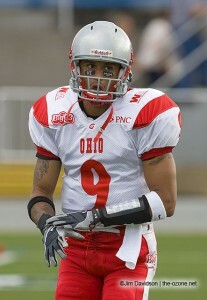 He then became a first-team All-Ohioan as a senior with 42 catches for 875 yards and a whopping 18 touchdowns. He caught a game-winning 55-yard touchdown pass to help the North defeat the South 37-30 in the annual state All-Star game and also played for Ohio against Pennsylvania in the annual Big 33 All-Star Game. At Youngstown State, playing football for current Ohio State coach Jim Tressel, Ray scored the only touchdown in YSU’S 10-9 victory over McNeese State in the 1997 NCAA Div. I-AA national championship game. Ray also hauled in a school-record long 90-yard touchdown catch against New Haven in 1998. When he finally hung up the cleats, Ray ranked third in YSU history for TD receptions (18) and receiving yards (2,173), fifth for receiving yards in a game (199) and sixth for career receptions (117). On the basketball court playing for the late coach Steve Smith, Ray combined smarts and athleticism to team with fellow All-Ohioan Marcell Denson to lead Orrville to state titles in 1994-95 (Div. III) and 1995-96 (Div. II). During his junior year, Ray was a special mention All-Ohioan and State All-Tournament team honoree. He led the Riders with 18.7 points a game and was second with 6.2 rebounds. As a senior, Ray was second for the Riders with 16.4 ppg., earned second-team All-Ohio honors and was again on the all-tourney team in Columbus. The four-year letter winner ranks third in Orrville’s storied basketball history with 1.360 points, is fifth with 448 rebounds and second with 339 assists. Ray now lives in Youngstown and has a job in the banking business, along with working for an agency that helps troubled kids and teens. He and his wife, Tatum, have two daughter, Ayla, 3, and Kaliana, 1.